On my daughter’s college tour road trip we pulled off the highway in upstate New York for dinner. Eating at a Cracker Barrel restaurant for the first time, we finished our meal and walked into the ‘Old Country Store’ part of the restaurant. Just as I entered there, filling a peach basket, is a big pile of Mallo Cups! In the past I had occasionally looked for them in candy and drug stores and had never been able to find them. I gotta tell you, they tasted better than I remember. They were fresh, the marshmallow was soft and the hint of coconut taste as you chewed was great. As a kid we had a gas station at the end of the street. This was the days before combination convenience/gas stations. This was a real gas station, with guys who would pump your gas, wash your windshield and add oil if needed. A small porch ran across the building. the sign read ‘Four Corners Service Station On The Hill But On The Level.’ The floor boards on the porch and in the building were well worn wood. The results of millions of trips from the pumps to the cash register inside. Tucked among the tires, spark plugs and oil cans in the back of the small room was a glass enclosed candy case. It was here I would ask Mister Tenczar (both the father and son) to get me a Mallo Cup. Amid the smell of rubber and petroleum I would belly up to the cash register counter and pay my 15-cents. Out the door devouring my Mallo Cups as soon as I was out on the street. That old Mobil station was torn down decades ago and replaced with a combo gas and convienence station with no where near the same character and no Mallo Cups. The peach basket brimming with Mallo Cups brought all this to my mind as soon as I saw it. Today there is a web site where you can find retailers who sell them. At least now I know where to find this treat. It is not often that something you remember as a kid meets, never mind exceeds, your memory. 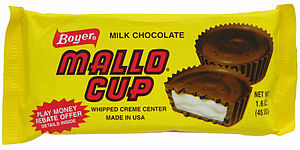 I am happy to report that in this case Mallo Cup delivers the goods! Posted on April 23, 2012, in Business, history, Life and tagged 70's, Boyer Candies, Boyer Candy Company, candy, Four Corners, ma, Mallo Cups, massachusetts, memories, Three Rivers. Bookmark the permalink. Leave a comment.